Add an exotic twist into your living room with our range of real cowhide cube footstools. 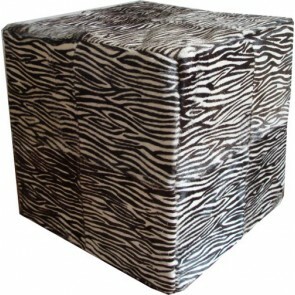 Choose from a zebra cowskin cube, brown and white cowhide footstool or a black cow hide footstool. These animal print footstools are a popular addition to contemporary homes. These real cowhide cube footstools measure 18" x 18" x 18" (46cm x 46cm x 46cm) and are filled with a foam block for a supportive seat. Take the plunge and add some drama to your living space.